Building empathy in the workplace is my number one goal when colleagues and I use improvisational theater tools in on-site, face-to-face workshops. It’s not about performing or comedy; it’s about broadening the soft skills of emotional intelligence. Developing verbal and non-verbal behavior, supporting our partners, and engaging in face-to-face conversation. A solution for building empathy in communication and collaboration. Imagine you could have a skill where–in any given conversation with colleagues, clients, or subordinates–you could be keenly aware of, and even experience, their feelings and thoughts. But this skill–and it is a learned skill available to anyone–is often misunderstood because there are variations of it. I’ll get to the science of it shortly. 2. The type of empathy where you imagine yourself in others’ shoes. 3. The type of empathy where you imagine the world, or a situation, from someone else’s point of view rather than your own. 4. The type of empathy that researchers sometimes call “mind reading.” It involves being good at reading others’ emotions and body language. If you’re skeptical that this is touchy-feely campfire nonsense with no business value in a transactional world, consider the research. Global training giant Development Dimensions International (DDI) has studied leadership for 46 years. They believe that the essence of optimal leadership can be boiled down to having dozens of “fruitful conversations” with others, inside and outside your organization. The findings, published in their High Resolution Leadership report, are revealing. 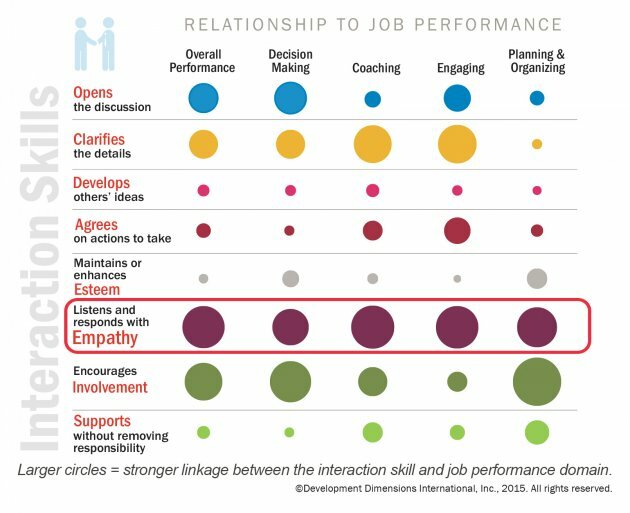 While skills such as “encouraging involvement of others” and “recognizing accomplishments” are important, empathy--yes, empathy–rose to the top as the most critical driver of overall performance. Empathy in the modern workplace is not just about being able to see things from another perspective. It’s the cornerstone of teamwork, good innovative design, and smart leadership. It’s about helping others feel heard and understood. This whole premise does have an air of genius about it, considering that when you take on the perspective of those you are talking with, it engages people on the spot. This can be a difference maker. That’s the good news. Keep in mind that empathy shows up in different ways, as I mentioned at the beginning. It’s not just “feeling.” Think how it can translate to both verbal and non-verbal behavior so the person hearing you will feel your empathic nature. And, it goes without saying, people see right through you if your empathy is not expressed in a sincere and authentic way. Don’t underestimate for a second its true potential. Begin developing leaders to learn this relational skill for competitive advantage. As an independent RN Patient Advocate, I guide and advocate for individuals in a variety of healthcare situations. On occasion these individuals are medical professionals, which suggests that we’re all vulnerable and confused when hospitalized. Here are highlights of a recent recommendation letter that advises every person to engage with someone qualified to advocate for you. “As a person who practiced medicine for more than 30 years in the Chicago area, I thought I was quite familiar with hospital medicine. But recently I was hospitalized and confronted an experience that was extraordinarily challenging. Luckily, I had made arrangements before this totally unexpected hospitalization to have Stephanie Frederick as my patient advocate. Stephanie was essential in communicating with the various providers and making sense of what was really going on. She also prodded them to meet with both of us to review progress. My recommendation to anyone facing potential hospitalization is to arrange in advance for a patient advocate. Personally, I can recommend Stephanie without reservation. If you engage her services, she will make sure she understands your medical condition, medications and other vital information before you are hospitalized. When and if you are admitted, she will be directly involved as your care proceeds and provide effective communication from you to medical providers and update you on their thinking. She will also provide information on drug interactions and dietary recommendations if appropriate.